[SatNews] In November 2013, a seafloor volcano in the western Pacific Ocean spewed enough material to rise above the water line—the new island, or Niijima, sprouted just 500 meters from Nishino-shima, another volcanic island that had last erupted and expanded in 1973–74. 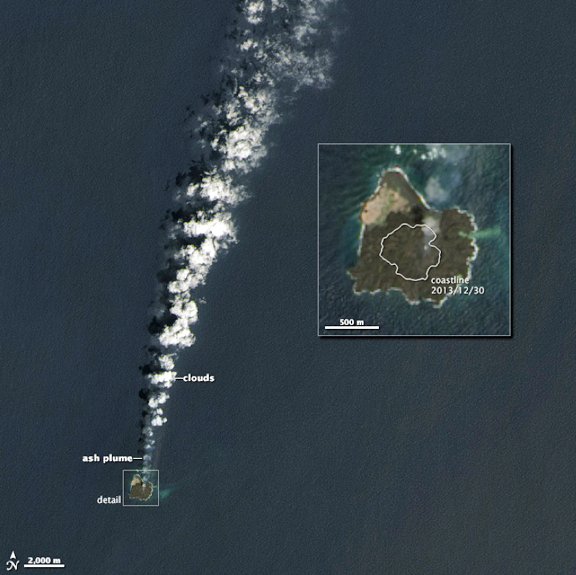 Four months later, the new and the old are now one island, and the volcanic eruption shows no sign of abating. A plume of volcanic gas, steam, and ash rises from the island. Tiny particles in the plume are seeding the formation of fluffy cumulus clouds. The intermittent, pulsing shape of the cloud stream might be a reflection of the volcanic eruption itself. Strombolian explosions are essentially bubbles of lava and gas rising from Earth’s interior in pulses. Underwater, sediment appears to be stirred up in a green plume that stretches eastward from the island.